The Bible does not mention any particular fish by name. "Dag" and "nun" are the generic terms covering all species, thus designated as exceedingly prolific and always to be found in shoals or in large numbers (comp. blessing of Joseph, Gen. xlviii. 16). The large seafish are collectively denoted as "tannin," though in this category quasi-mythological creatures (see Dragon) are also included. By the Dietary Laws fish are divided into clean and unclean (Lev, xi. 8 et seq.). The majority of fishes have scales and fins, and therefore belong to the clean class; but, contrary to their natural order, eels are counted in the unclean class ('Ab. Zarah 39a). Speculations on the nature of the fish mentioned in the story of Jonah (ii. 1-11), or of that by which Tobit (vi. 3 et seq., viii. 2, xi. 13) was relieved of blindness, belong to the category of Biblical curiosities. Fish, both fresh and salted, constituted a favorite dish among the Hebrews (see Cookery; Food). On this account the Talmudists value fish highly. Both large and small fish, salted or fresh, raw or cooked, were considered delicacies (Ned. vi. 4). Chopped fish-meat (e.g., tunny-fish) was offered for sale and largely consumed, and the brine from the salted fish ("ẓir") was used, as well as the fat or oil (ib.). A dish composed of pieces of fish was known and much affected under the name "ẓaḥanah." As the meaning of this name, "evil-odored," indicates, fish was believed to be best when near decomposition (M. Ḳ. 11a). Small fish were especially recommended as wholesome food (Ber. 40a; 'Ab. Zarah 29a). 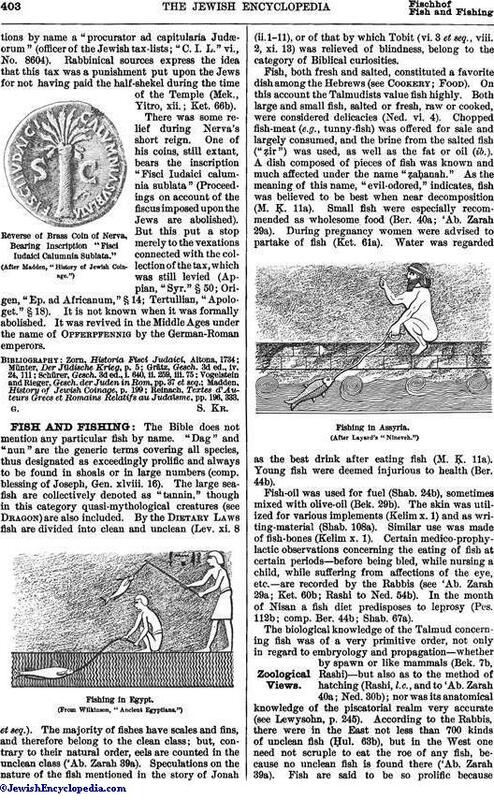 During pregnancy women were advised to partake of fish (Ket. 61a). Water was regarded as the best drink after eating fish (M. Ḳ. 11a). Young fish were deemed injurious to health (Ber. 44b). Fish-oil was used for fuel (Shab. 24b), sometimes mixed with olive-oil (Bek. 29b). The skin was utilized for various implements (Kelim x. 1) and as writing-material (Shab. 108a). Similar use was made of fish-bones (Kelim x. 1). Certain medico-prophylactic observations concerning the eating of fish at certain periods—before being bled, while nursing a child, while suffering from affections of the eye, etc.—are recorded by the Rabbis (see 'Ab. Zarah 29a; Ket. 60b; Rashi to Ned. 54b). In the month of Nisan a fish diet predisposes to leprosy (Pes. 112b; comp. Ber. 44b; Shab. 67a). The biological knowledge of the Talmud concerning fish was of a very primitive order, not only in regard to embryology and propagation—whether by spawn or like mammals (Bek. 7b, Rashi)—but also as to the method of hatching (Rashi, l.c., and to 'Ab. Zarah 40a; Ned. 30b); nor was its anatomical knowledge of the piscatorial realm very accurate (see Lewysohn, p. 245). According to the Rabbis, there were in the East not less than 700 kinds of unclean fish (Ḥul. 63b), but in the West one need not scruple to eat the roe of any fish, because no unclean fish is found there ('Ab. Zarah 39a). Fish are said to be so prolific becausethey are not exposed to the evil eye (Ber. 20a). Among other cities Acre seems to have been regarded as a great fish-market: hence the proverb "Carrying fish to Acre," an equivalent of the English "Carrying coals to Newcastle" (Ex. R. 126c). Stories concerning fish are not rare in the Talmud (Rabba Bar Bar Ḥana; 'Ab. Zarah 39a; B. B. 73b, 74a). Among the fish specifically mentioned in the Talmud the following are the best known: the Spanish mackerel ("colias"), the common tunny, the triton, the swordfish, the herring, the sprat, the eel, the muræna, the sturgeon, and the tonguefish. In view of the fact that the Lake of Gennesaret and the Jordan, if not the Dead Sea, were well stocked with fish, it is reasonable to presume that fishing was among the occupations of the ancient Israelites, though comparatively few references to it are found in the Old Testament. In Amos iv. 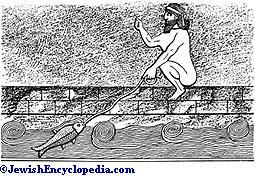 2 designates "fishing," while the fisherman is known as (ḳeri ) in Jer. xvi. 16 (comp. Ezek. xlvii. 10). Among the fishing-implements mentioned are the "mikmeret," a drag-net thrown out from a boat, and which, loaded, sank to the bottom (Isa. xix. 8; Hab. i. 15); and the "ḥerem," a smaller net which was thrown either from the boat or the shore (Ezek. xxvi. 5, 14; Hab. i. 16, 17). Hook and line were also in use ("ḥakkah," "sir," "ẓinnah"; Amos iv. 2; Isa. xix. 8; Hab. i. 15). The "ẓilẓal daggim" mentioned in Job xl. 31 seems to have been a harpoon. 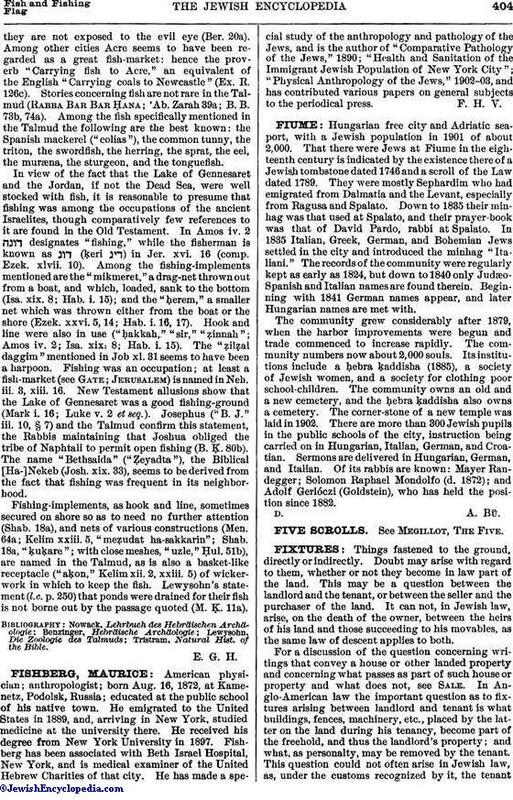 Fishing was an occupation; at least a fish-market (see Gate; Jerusalem) is named in Neh. iii. 3, xiii. 16. 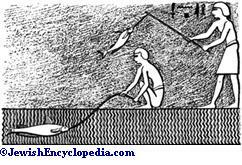 New Testament allusions show that the Lake of Gennesaret was a good fishing-ground (Mark i. 16; Luke v. 2 et seq.). Josephus ("B. J." iii. 10, § 7) and the Talmud confirm this statement, the Rabbis maintaining that Joshua obliged the tribe of Naphtali to permit open fishing (B. Ḳ. 80b). The name "Bethsaida" ("Ẓeyadta"), the Biblical [Ha-]Nekeb (Josh. xix. 33), seems to be derived from the fact that fishing was frequent in its neighborhood. Fishing-implements, as hook and line, sometimes secured on shore so as to need no further attention (Shab. 18a), and nets of various constructions (Men. 64a; Kelim xxiii. 5, "meẓudat ha-sakkarin"; Shab. 18a, "ḳuḳare"; with close meshes, "uzle," Ḥul. 51b), are named in the Talmud, as is also a basket-like receptacle ("aḳon," Kelim xii. 2, xxiii. 5) of wickerwork in which to keep the fish. Lewysohn's statement (l.c. p. 250) that ponds were drained for their fish is not borne out by the passage quoted (M. Ḳ. 11a). Tristram, Natural Hist. of the Bible.